good and yet weak, that he was afflicted by false pride and supported by true pride, that his intellect was still very bright, yet so dismally obscured on many sides as almost to justify people in saying that he was mad. She knew that he was almost a saint, and yet almost a castaway through vanity and hatred of those above him. This astute insight into her husband’s grotesquely conflicted, flawed character from one of Trollope’s typically wise, sympathetic mature women is again highlighted by that telling use of repetition and the symmetrical balancing of synonyms with their antonyms, enhanced by the spot-on rhythm, imagery and cadence of the sentences. But she did not know that he knew all this of himself also. She does not comprehend that he castigates himself constantly with the knowledge that people ‘were calling him mad and were so calling him with truth’, and neither does she ‘dream’ that ‘he was always inquiring of himself whether he was not mad’, and should therefore resign his pastoral office. Even as shrewd an observer of this difficult man’s complex nature as his wife is surpassed by our narrator in psychological perspicacity – and all of this conveyed with a subtlety and sympathy that in other Victorian novelists would be praised as genius. This is a superb ending to the Barsetshire novels. The three sub-plots are less satisfying than that of the public humiliation and redemption of Crawley: Trollope’s lack of sustained interest in romantic plots is apparent in his recycling of the doomed Lily Dale-Johnny Eames affair from the previous novel – he even gives Eames another foolish and dangerous romantic London dalliance to take his mind of his humiliating, dogged pursuit of annoying country belle Lily. Trollope also returns to his staple plot of a spirited son’s defiance of parental disapproval of his choice of wife whose lowly social-financial status is their main concern (Henry Grantly and Crawley’s daughter Grace). The other London plot involving a society artist’s flirtation with a woman married to a dodgy city ‘financier’ (usurer/loan-shark) is more lively and exciting, but skirts close to farce towards its end – as the Johnny Eames flirtation plot does. 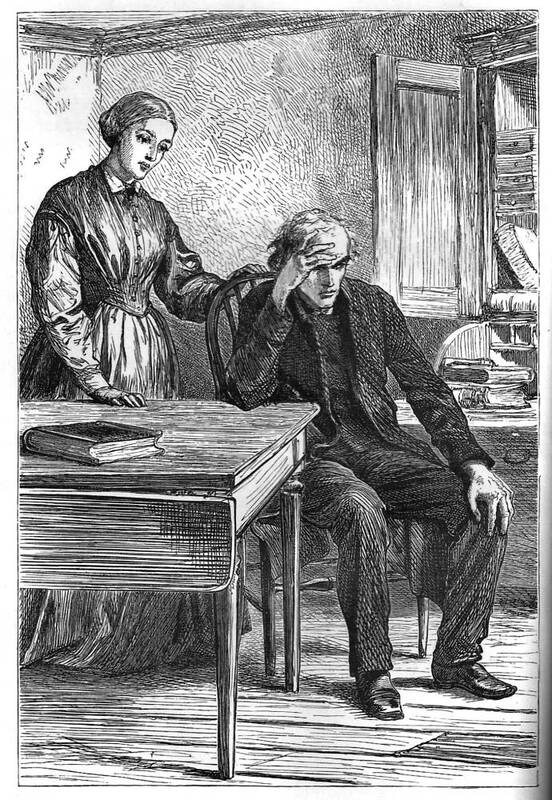 What lingers in the memory after finishing this fine, uneven novel is the portrayal of noble, heroic, infuriating Crawley, wallowing in self-pity and rancour, spurning the kind offers of aid from his loving friends and family, but capable of facing down the bullying of Mrs Proudie, and of providing genuine support and comfort to the oppressed brickmakers and their families who live in his impoverished parish. Good to see the indomitable Miss Dunstable, now Mrs Thorne, reappear and provide moral sustenance for faltering lovers – though even she’s incapable of enlightening the ‘morbid’ tenacity of Lily’s infatuation with the scoundrel Crosbie. 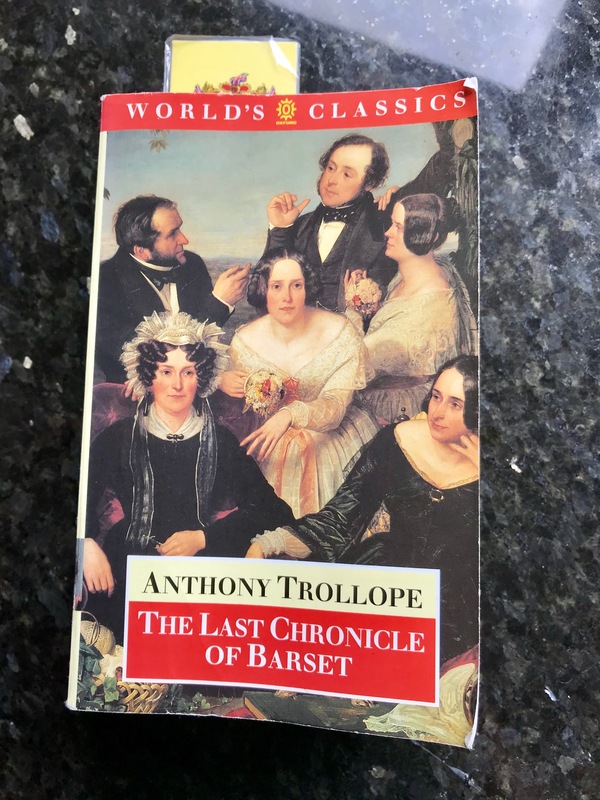 This entry was posted in English Literature and tagged Anthony Trollope, George H. Thomas, Oxford World's Classics, The Last Chronicle of Barset by Simon Lavery. Bookmark the permalink. Thank you for the link. I learned only recently that Millais had been Trollope’s illustrator. I own two different editions of The Barsetshire Chronicles, one from Penguin (with the black cover), and the other from Everyman’s Library, and, unfortunately, neither of them includes any illustrations. I’ve just had a look at an older Penguin edition of Can You Forgive Her ?, no illustrations either. I wonder why. Dickens’s novels are always illustrated, aren’t they, so why not Trollope’s ? I read this one a long time ago and have forgotten most of it, but I remember it was one of my favourites at the time. AT’s prose may not poetic but it’s certainly efficient. And the twist, my God the twist ! What a shock I had ! It’s an interesting question, Izzy, about the illustrations. 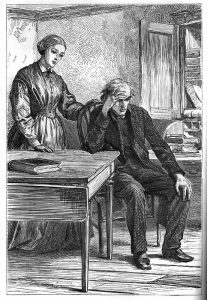 If you read the pieces I linked to – there’s quite a lot more material on the Victorian Web site – you’ll see that AT came to be less than enthused by his illustrators – though he seemed to be ok with Millais. There’s a book called T and his Illustrators by N. John Hall that I’ve saved on an Amazon list, but it’s quite expensive even second hand, so I’m not sure I’ll invest just yet. I think the Oxford hardback editions of Victorians like Dickens tend to include some of the original or early illustrations; haven’t checked if they do with AT. Outstanding commentary on this book. I also thought that it was a fitting ending for the series. I also agree that Crawley is such a well crafted character. As such he may be my favorite of the series. He is a joy to read about. And wear warm clothes, and even beasts have stalls’. Crawley too is wrestling with the dim awareness that even as he boasts to himself what a saintly person he is, he’s perilously close to the sin of pride, and secretly fears he is an egregious failure, not a saint – Mrs C also perceives these weaknesses (and strengths) in him. It’s a fascinating portrayal – far more interesting than the rather vapid lovers in the other plots. Once again, keeping this to refer to if I ever get to this one!